← What Does The Conductor Actually Do?! The Grand Piano That Is Making Waves! 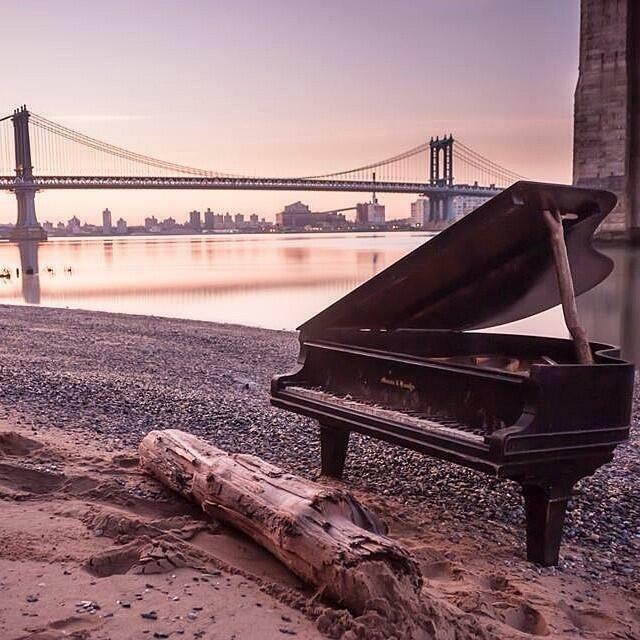 New Yorkers are flocking to take photos and give silent recitals on a grand piano that was mysteriously abandoned in the East River. The Mason & Hamlin piano – found under the Brooklyn Bridge on the Manhattan side – sits half-submerged at high tide and mostly exposed at low tide. As yet, no one knows where it came from, or why it is there. Many believe it was planted there as an art installation; others think it might have fallen from a truck travelling into the city. Although the instrument makes no sound, it has captured the imagination of New Yorkers, with hundreds of photos making their way onto social media as locals make the most of the new addition to the riverbank. This entry was posted in About Brendan Ball and tagged abandoned, bridge, brooklyn, grand, manhattan, New York, piano, river, silent. Bookmark the permalink.